1. Go to Mass as a family on Ash Wednesday. 2. Read the Scripture about when Jesus went into the desert. 3. Motivate your children to do good deeds and make sacrifices. 4. Give something up for Lent as a family, even if you children are young enough that you don’t “have” to. 5. Set up an almsgiving box- you simply set out a box, and take 1 thing from your own pantry every day of Lent. At the end of Lent, take the box of food to Church. 6. Set up an offering jar- all you need is a jar or piggy bank of some kind. Spare change goes into the jar for the length of Lent, and then is donated. 7. Add extra prayers to your daily life. Maybe this is extra prayers in the morning or at bedtime. If you have older children, encourage them to set extra goals for personal prayer as well. 8. Pray the Sorrowful Mysteries of the rosary together- daily, weekly, whatever works for you. If this feels overwhelming with little children, try just 1 decade. 9. Pray the Divine Mercy Chaplet together- this is also a faster option than a rosary for those with little ones. 11. Cook some meals together. 12. Pray daily, as a family. 13. Go to Adoration. Even if you cannot stay long with little children, it’s still worth going. 14. Go to Confession as a family. 15. Read the Penitential Psalms. 16. 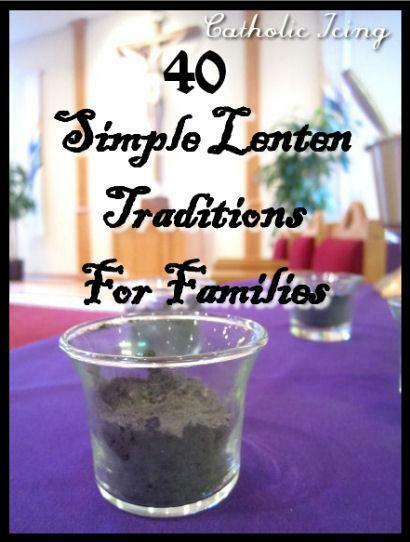 Count down the days of Lent with a Lenten calendar for your children. 17. Create an ‘Alleluia banner,’ and bury [hide] it during Lent. 18. Attend Stations of the Cross. 19. Cook simple meatless meals together with your children. This will be a good sacrifice opportunity for you. 20. Participate in the Stations of the Cross. 21. Learn some new hymns with your family. 22. Wash your children’s feet on Holy Thursday. 23. Encourage better attention during Mass by assigning each member of the family 1 reading to pay special attention to [first reading, Psalm, second reading, and the Gospel]. Have everyone give a re-cap of “their” reading when you get home. Have a family discussion if anyone had thoughts about the readings. 24. On Good Friday, have an hour of silence at your house from 3-4 [because Jesus died at 3]. Allow your children to read spiritual books during this hour of silence. 25. 40 bags - 40 days. You pick the size of the bag (Paper bag, supermarket bag, garbage bag, lunch sac, etc.) and you get rid of 1 bagful of clutter from your house every day. Donate what you get rid of. This is an excellent exercise in living simply. 26. Lenten cleaning- rather “spring cleaning.” Clean 1 area of your home every day during Lent. Your house will be beautiful and clean for Easter! 27. Sing a Lenten hymn together each day as a family. 28. Attend extra activities happening at your parish. 29. Do some of the works of mercy together with your children. 30. Watch a Lenten movie together as a family. 31. Read 1 Saint story per day. 32. Read the Bible together as a family daily. This can be done in the morning at breakfast, and doesn’t have to take long. You can just read a paragraph each day. 33. Decide 1 day of the week during Lent to go “screen free” as a family. Spend time without the TV. 34. Light a candle at Church on Sunday. 35. Decorate your house for Lent. Put a purple table cloth out on the table. Explain liturgical colors to your children. 36. During Holy Week, read the stories of Palm Sunday, the Last Supper, and the Crucifixion from the Bible. 37. Memorize a new prayer together as a family. 38. Join Holy Heroes Lent adventure [[http://www.holyheroes.com/Holy-Heroes-Lenten-Adventure-s/37.htm]. You will find lots of online activities on this Site. 39. Basically, make sure you are including more prayer, fasting, and almsgiving than during Ordinary Time. 40. And the number 1 easy thing that takes NO extra effort that we really want you to do is…. SAVE ALL OF THE EASTER CELEBRATING FOR EASTERhttp://www.catholicicing.com/observe-lent-then-celebrate-easter/!